Your team is your most important investment. Cultivate strong relationships and get aligned with our one-on-one template. How are both of you feeling at work? Anything new? Anything exciting planned? Take some time to catch up with each other. Have any issues or challenges come up since the last one-on-one? How can we help? What have we accomplished since our last meeting? What valuable lessons were learned? What are the most important things we'll focus on going forward? Are there any new objectives? How do these fit into the short-term and long-term goals? What steps must be taken to make progress on our goals? List them here as well as who is responsible for what. Set clear expectations and timelines. What was mentioned that should be noted and deferred? Is there anything either party would like to discuss during the next one-on-one? Is there any other noteworthy feedback? How can we help each other be more successful? How will we keep in touch and stay up-to-date about progress? Should we schedule another one-on-one? One-on-one meetings are unlike any other. They're a special opportunity for managers to connect with their team and create resilient relationships. When done correctly, one-on-ones enable hardworking, engaged employees to reach their full potential. Help your team members reach theirs with our one-on-one template. For many business leaders, one-on-one meetings are the most important meetings they have. But many managers waste them due to a lack of structure, alignment, and action. With simplicity, transparency, and engagement, this meeting note template lets you make the most of every one-on-one. 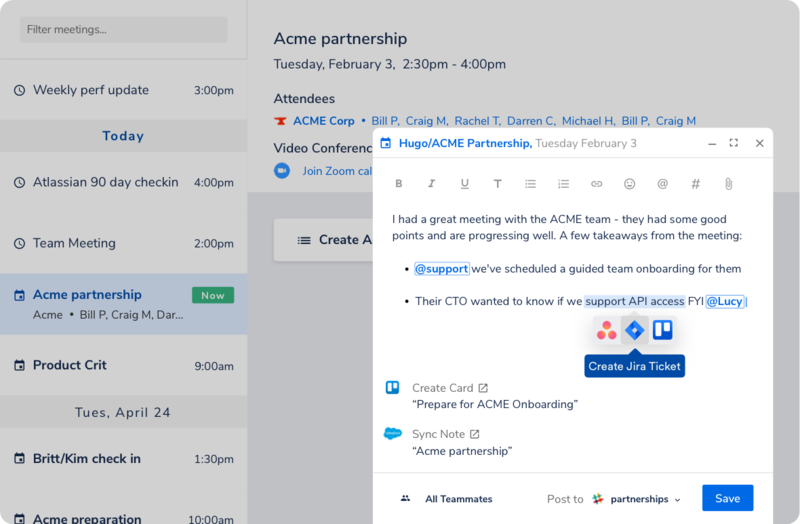 We've created a one-on-one template that grows alongside your meetings. Consistency is key to running successful one-on-ones. Unfortunately, agendas can change from meeting to meeting. With this flexible meeting note template, you can start now and iterate as you go. This allows you to establish continuity between meetings, which is the secret to continuous improvement. Above all else, one-on-ones are a time for alignment. With seamless sharing capabilities, our one-on-one template enables both parties to contribute talking points and feedback to the agenda anytime. By giving employees access to the template and the ability to guide the conversation, you open the dialogue up to true transparency. In turn, this establishes trust and lets you get a better understanding of each team member. Lastly, our meeting note template empowers all of your one-on-one insights with engagement. Actions speak louder than words. With integration into your favorite tools and the ability to transform insights into assignable action items, you can start translating your notes into value right from this outline. Your team is your most important investment. Cultivate strong relationships, grow together, and build a better future for your business with our one-on-one template.